From World War II Forums - After resistance by the main part of Sparrow Force had ceased in Dutch West Timor on 23 February 1942 the 2/2 Independent Company began to re-organise and deploy. Mr. David Ross, the Australian Consul and a naval intelligence agent, held at Dili by the Japanese, was sent to seek out the Australian guerillas with demands of surrender. Which the Australian senior command refused, he also gave them a note saying that any purchasing of food or other commodities signed by senior officers would be later honoured by the British and Australian governments. And most of all he gave information on the defences around Japanese occupied Dili. Assisted by the payment notes Ross gave, and to a very large extent by the unremitting efforts of Senor Antonio Policarpe de Sousa Santos, in charge of Fronteira Province and by their own efforts the food situation improved. With vigorous and wide patrolling and information from native sources with a constant flow of information thru the Portuguese telephone system linked to Portuguese administration posts, the company commander Major Spence was well aware of Japanese troop movements. By March 1942 about 200 stragglers from the captured main force in Dutch Timor had safely been collected in the southwest of Portuguese territory, though mostly unarmed and sick, were under the command of Brigadier Veale, overall commander on the whole island of Timor. Some 150 Dutch troops were also in the southwest corner and spread thinly into Dutch territory under Dutch Colonel N.L.W van Straten. By early April the Japanese pushed inland, Villa Maria to Lete Foho and from Ermera and Dili, the Japanese suffered heavily to the harassing commandos. Another event at the end of April was 'winnie the war winner' an improvised wireless radio set created by a small dedicated group, the expert and tireless effort of signalman Loveless, Sousa Santos with generous and skilled help and Captain Parker Sparrow Force signals officer. Back in Australia they were astonished that a force was still fighting on Timor, by the beginning of May aircraft were dropping supplies, the period of Sparrow Force isolation was ended. Maj-Gen Herring's, Northern Territory Force HQ reported to Army HQ that the Japanese had 1,500 men based at Dili and could be mopped up with an additional 300 guerillas, if their position didn't deteriorate. By 3 May it was important that the men on Timor Island should maintain the offensive spirit, keep up the information flow with a view to use Timor as a commando and guerilla base extending to other islands in the region. Allied land Force HQ also told Herring that they had no present intention to reinforce the guerillas in East Timor but would maintain them. Portuguese "deportados", these were men who because of their revolutionary activities had been banished to the most distant Portuguese possession and under Garnett's prompting they became actively helpful and operated with the Australian patrols. Not more than about six blokes in numbers, a small and colourful bunch named by the Australians as the "international brigade" plus some deportados led by Pedro Guerre sneaked a Qantas Empire Airways transmitter and receiver set out of Dili under the noses of the Japanese, these much needed parts supplemented 'winnie. On 22 May a Japanese party was moving on Remexio, an Australian patrol with the international brigade killed 4 or 5 Japanese soldiers. Further down the track another ambush was sprung by Cpl. Aitkens and his patrol, killing about 25 enemy troops. The first to fall was the 'Singapore Tiger', a ruthless Japanese major with a chest full of glistening trinkets sitting high and mighty on his white horse leading the enemy column, versed in bush warfare and specially brought from Singapore to deal with the troublesome Australians. The Japanese returned to Dili for funeral commitments, the Australians returned to Remexio triumphant. At this time the morale of the Australians on Timor was exceptional, they were operating vigorously and efficiently, a picturesque band, tattered, bearded, lanky, each man accompanied by one or more loyal local natives, called creados, to assist and serve them personally into and out of battle and were welcomed by villagers as winners. On 24 May a Catalina bringing stores brought back to Australia Brig. Veale and KNIL Colonel van Straten plus three wounded and four sick soldiers. Spence was promoted to Lt-Col replacing Veale as overall commander, and Captain Callinan promoted to 2/2 Independent Company commander. In the early evening of 27 May HMAS Kuru, a naval launch with a cargo capacity of 5-6 tons, arrived on one of many dangerous and exciting trips, also HMAS Vigilant, 7 tons capacity, also ran a series of re-supply and evacuate trips to Japanese occupied Timor. On the 3 June General Blamey suggested to MacArthur that two courses of action were open to him, to recapture Timor or withdraw the bulk of the force. To attack Timor Island would require at least two brigades, perhaps a division, that success would require that this force be carefully trained in amphibious landings on hostile shore, be equipped with suitable ship landing craft and support by air and naval forces essential. The withdraw of the bulk of the force did not present any great difficulty. The retention of this force at Timor will greatly facilitate offensive actions when necessary means are at hand. These forces should not be withdrawn under existing circumstances, rather it is believed that they should remain and execute their present mission of harassment and sabotage. The retention of the bulk of these forces at Timor will necessitate a carefully prepared plan of supply and for the embarkation in case the Japanese make a substantial effort against them. Meanwhile in early June the Australian government had learnt through the Dominions Office of a proposal by the Portuguese government, that diplomatic concourse should open negotiations for the withdrawal of the Japanese in return for the surrender of Australian troops to Portuguese authorities for internment in Portuguese East Timor. The Australian Chiefs of Staff advised the proposal be rejected and MacArthur agreed. Late in June Ross arrived again from Japanese occupied Dili to the Australian position with demands of surrender. He had warned the Japanese consul and commander that the Australians would not fall in with the demand. The Japanese commander also asked Ross to give his compliments to the Australian commander and admired the way the Australians fought, and had kept fighting. He added that he thought they should come to Dili and fight it out till the last man, if they would not do this he would take his troops into the hills and fight it out there. Ross said the Japanese have sufficient troops to round up the Australians, the Japanese colonel agreed and admitted that from his experiences in Manchuria and reading about the Boer War in South Africa at the turn of the century it required ten regular soldiers to kill each irregular, he added "I will get what is required." Ross this time had not promised to return to Dili and he remained with the commandos in the hills of East Portuguese Timor then later was sent out to Australia. Where on 16 July 1942 he described the situation on Timor to the Advisory War Council. Through July the Japanese commander's threats began to materialise, fresh troops arrived at Dili and the forward enemy observation posts returned to Dili. The Japanese were extremely passive as though gathering and containing themselves for a major effort. There were also disturbing and increasing indications that some Timorese inhabitants were becoming not only unfriendly but actively threatening to the Australians. On 9 August the Japanese began methodically bombing inland villages in a series of air raids which the Australians were using as key points. The pattern emerged that perhaps 1,500 to 2,000 Japanese were on the march, with it a wide spread and well-organised plan developed to destroy the Australians and Dutch forces. One enemy column moved south from Manatuto, two columns from Dili, one southeast then south to Remexio, the second due south through Aileu, another Japanese column crossed the Dutch – Portuguese border at memo and advanced on Bobonaro through Maliana. Attacks from Dutch Timor developed against the Dutch positions in the southeast around Maucatar. A Japanese party landed at Beco, after effective attacks by eighteen Hudson bombers. The Portuguese telephone system was disrupted. In the western sector, Rita Bau, Atsabe, as the Japanese advanced, the Australians fighting a rearguard and manoeuvring skilfully found their paths hampered by natives, mainly from Dutch West Timor, who the Japanese used as a screen. These Japanese sympathisers moved through bombed villages adding demoralisation to the bewildered locals, using on the villagers simple reasoning that surely this time the end has come for the Australians and no sensible man, or women and child, would side with the loser. As the Japanese pushed the Allies back, Callinan was in a desperate position. Australian units were forced beyond Astabe, pushed back from Maubisse and nothing in front of the Japanese column moving down from Littai. Yet on the night of 18-19 August the Japanese shot green flares into the dark sky, the attackers withdrew, the Australians quickly hurried after them harassing their rear and flanks. This withdraws meant temporary relief but troubles with the natives threatened to become increasingly acute. These troubles took the form in late august and during September, largely clashes between Portuguese troops and the restless inhabitants, and between rival bands of natives. In the latter part of August the Maubisse natives rebelled against Portuguese authority and killed the Portuguese administrator in that area. Detachments of Portuguese police and soldiers at once took to the hills to quell the disorder. Having first been assured by that the Australians would in no way interfere in these matters of local administration. On 27 August a native band of some two hundred strong, armed to the teeth with knifes, spears, machete, bows and arrows set out form Ainaro for Maubisse to join in the hunt for the rebels. Seeing this the Australians felt that they were merely witnessing the opening scenes of large scale disorder, which could not fail to react upon their own situation. September made this speculation clearer as the Japanese were fomenting the disturbance. How long the Australians could stay aloof and regard the troubles as purely domestic was open to debate. "The local private war" wrote the war diarist of the 2/2 Independent Company, "Portuguese verses native, still goes on its blood thirsty way. One of our patrols near Mape, out hunting the Jap encountered a Portuguese patrol out hunting natives; they exchanged compliments and went their various ways". "Company HQ witnessed the spectacle of 3,000 natives, all in war dress and armed to the teeth. Also complete with drums and Portuguese flag returning from the hunt with many of them nonchalantly swinging heads of the unfortunate in battle". During September the Japanese moved inland and along the north coast. The Australians learnt a fresh enemy division had relieved the original Timor garrison. The Japanese 48th Division; 1st and 2nd Formosa Infantry Regiment and the 47th Infantry Regiment. The 47th Infantry Regiment arrived in on 24 August and had part in the Philippines campaign December 1941 – January 1942 then XVIth Army for the invasion of Java Island. The division was concentrated on Timor by 9 November. The 228th Infantry Regiment, with a battalion in East Timor since the invasion, were redeployed from Timor to Rabual on 5 September and the ending of the Japanese attacks in August was their need for preparation time in departure by sea. There were also reports of a new regime in Dili imposing rigid security around the capital. On 12 September the Portuguese report a large strong force of Japanese and Dutch West Timorese were moving across the border to Dili, through Hatu-Lia and Ermera. The Japanese landed at Manatuta, 10-20 September, splitting into two forces, one southward to Dili and the other moving further up the coast. On 21 September a party of 400 Japanese and many natives entered Aileu and the next day reached Maubisse. On the way to Ainaro three enemy parties were ambushed by the Australians. The next day the Japanese occupied Ainero. Meanwhile in Australia, 12 August, General Blamey's HQ, Brisbane, told Major-General Steven, CO Northern Territory Force, that they were considering sending a small force to relieve the pressure and clear the Japanese from the Australia area. They envisaged a maximum strength of five hundred. Stevens replied that the minimum of Japanese battalions is four, if not five, that sending two companies would be useless sacrifice and brigade strength would guarantee a successful outcome. Finally it was decided the 2/4 Independent Company should go, under Major Walker, based at Katherine, patrolling lines of communications along the Roper, Victoria and Daly Rivers in northern Australia. They were relieved of this task in August by the 2/6 Cavalry Regiment and the Northern Australian Observation Unit, then attached to 19th Brigade. On 9 September Stevens told Walker to take his commando company to East Timor, establish an OP to watch Dili, obtain information regarding Japanese movements and harass at every opportunity. But to be wary until he had got to know the country and the local population. Walker embarked with the advance party on 12 September at Darwin and the main body followed later on the destroyer HMAS Voyager. The warship began to unload off the east coast near Betano in the late afternoon of 23 September and went aground. The next day the vessel was attacked by Japanese aircraft, the seamen manned the AA guns on the stranded warship and most of the bombs fell wide. The captain ordered Voyager destroyed and were soon picked up by the Australian corvettes Warrnambool and Kalgoorlie. On 27 September some 2,000 Japanese troops moved south from Dili to Aileu and the next day screened by native scouts continued to Maubisse. This movement of strong Japanese forces was towards the stranded Voyager and when the enemy left Maubisse, Boyland's platoon and Captain Thompson's of the 2/4 inflicted heavy casualties. But the Japanese were determined fighters and coolly outflanked the ambushers, forcing them to fall back south of Same. In the eastern part of the island, watching the road from Baucau to Beasso, the 2/2 Independent Company group under Lieutenant Doig and co-operating with them a Dutch detachment took up positions at Ossu. October saw vigorous actions against the Japanese patrols particularly by the fresh 2/4. Nevertheless the month was chiefly remarkable for the Japanese fomented disorder among the population and the necessity for meeting this ever worsening situation limited the actions the Australians could take against the Japanese. The Japanese exploited the natives shrewdly, parties of fifty to sixty natives would press against the Australians, usually urged by a few Japanese in the rear. Almost daily Australian groups would report conflict with such bands resulting in the shooting of perhaps, ten, twenty or thirty natives and possibly a Japanese overseer or two. But the Japanese were now not only concerning themselves with stirring up the natives against the Australians, they also were trying to destroy Portuguese control. Between May and October at least twenty-six Portuguese nationals have been killed, including the murder of three women and a priest. In Aileu they incited attacks on the residence of the District officer. In November the District Officer at Manatuto and his secretary were killed and soon after the Portuguese official at Fuibro was murdered. However the Japanese evolved a "neutral zone" idea and ordered all Portuguese citizens to assemble in this area west of Dili by the 15 November. After that date all Portuguese nationals will be under Japanese protection, for what it was worth, and others outside that area would be treated as active helpers of the Australian commandos. At Hatu-Lia a gathering of Portuguese men met to discuss the position, they wanted the government of Lisbon to know of their plight in the colony and for protection for their women and children, and arms to defend themselves. And if the women and children were removed to a safe area they would fight with the Australians and Dutch. Callinan said that the only safe area was the Australian mainland, a difficult evacuation indeed, that he would like officials to maintain order among the natives and had already asked Army HQ for arms issue to officials and would order Australian troops to patrol in conjunction with the Portuguese parties. Callinan left the meeting to return to HQ, arriving at Ainero he found a willing fight going on nearby, villages burning, hostile natives from Maubisse being driven off by Australian small arms fire and natives loyal the Aussies armed with bows and spears yelling wildly getting close enough to use their primitive weapons. He also found there a message to suspend all offers of arms to the Portuguese and natives, pending further investigation by the Australian government. However on 1 November arming the locals for guerilla warfare against the Japanese and quislings was approved. By this time the 2/2 was coming to the end of its campaign endurance, they had been in action for nine months under great mental, physical hardship and stress of war, lacking a balanced diet, malaria, dysentery and some 26 casualties since the Imperial Japanese invasion. On 24 November Australian Land HQ approved the relief of 2/2 Independent Company, the evacuation of 150 Portuguese and that the 2/4 Independent Company was sufficient to carry out the set military tasks on Timor. There were about 500 Portuguese women and children on the half an island and about 300 wanted out, as described in a 'most secret' report by Major Callinan to the Commanding Officer- November 1942, from the Blamey Papers book. From the 11 November Callinan took overall command of Sparrow Force on Timor, Laidlaw was promoted CO of 2/2 and Spence returned to Australia. By this time the Japanese were working to develop the east part of the island, building airstrips and supply dumps. Maubisse was the main centre of hostilities to the Australians. Along the south cost the Japanese were moving eastward consolidating at Hato-Udo area. On 27 November Callinan was ordered to evacuate 190 Dutch troops who had been fighting alongside the Australians since the Imperial Japanese invasion, a smaller Dutch detachment to be sent will be relieving them. On the night 30 November – 1 December HMAS Kuru and two Australian corvettes, Armidale and Castlemaine would run into Betano pick-up the Dutch soldiers and 150 Portuguese citizens and the 2/2, leaving the fresh Dutch troops. The corvettes were attacked on route to Timor but the Kuru met them on its return to Darwin transferring the refugees to Castlemaine. Kuru and Armidale, carrying the Dutch unit, ventured to Timor and were prevented from making landfall. The Armidale was sunk yet the enemy could not hit the smaller vessel Kuru. Darwin HQ informed Callinan that rearrangements would be made and embarkation to be covered by land forces and secrecy. The Dutch destroyer Tjerk Hiddes was to lift the first flight of 2/2, 'D Platoon and hospital patients, on the night 11-12 December, including Dutch stragglers and some more Portuguese people. Embarkation was switched to the mouth of the Qualan River and went smoothly. The Japanese made a demonstration from Same to Fatu Cuac but were forced back by Laidlaw's old platoon under Nisbet. The departing Australians and twenty-four Portuguese were able to board Tjerk Hiddes around midnight on 15 December and headed for home and safety. 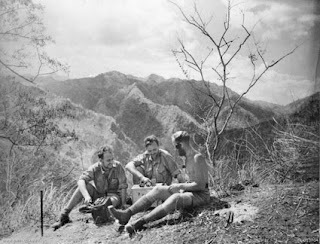 Callinan and Baldwin remained on Timor with the Australian HQ at Ailec with Walker. Callinan gathered around the creados who had served him and his men so faithfully. They couldn't return home for the Japanese had occupied their area making it unsafe. Each loyal native carried a note from his former master which Callinan read; 'In many cases it didn't require the surat (note) to tell that Mau Bisse, or Antonio, or Bera Dasi, or whoever' "was a good boong – treat him well he deserves it". Their feats of loyalty and courage were well known, this one stayed with his wounded master and moved him out from Japanese searching. This one had taken an important message through Japanese lines to a section cut-off by rapid enemy movement, this one had risked his life carrying mail and secret messages:' extract from book titled Callinan – Independent Company. After the depature of the 2/2 Independent Company the Japanese and hostile natives were quickly becoming more active and widespread. Scarcely a day would not pass without Australians skirmishing with them. Callinan told Australia that arming the natives who were deemed to be friendly was a danger which might ultimately destroy the guerillas themselves but nevertheless it offered the only chance of retaining vital areas to the Australians. He doubled his efforts to organise and train them. Japanese pressure from the west was driving natives eastward and putting a strain on the food resources in that region. Unrest grew to such an extent that natives would not move outside their own local area. This also affected the flow of information and more time being taken to native administration. The anarchy that developed left the local people without central authority, so the Timorese turned to the Australian military leaders for direction and settlements of domestic disputes. Meanwhile the HQ Army leaders in Australia became increasingly concerned with the position of "Lancer Force", new name in November. They had no immediate intention to retake Timor but a study of the strategical importance of Timor in relation to Australia was commissioned. The Australian Chiefs of Staff estimated that there were than at the time about 12,000 Japanese on Timor and that its capture and retention would require the use of strong air and navy elements plus three divisions with additional non-divisional troops. They considered General MacArthur's advice was essential before the Australian government could consider the matter further. Blamey wrote "As a matter of simple fact an operation against Timor is in the immediate future completely out of the question – I have no hesitation in saying that the preparation of a scheme for the capture of Timor is at present juncture, a pure waste of time. Firstly because we cannot disengage ourselves from present area of operations", from the Blamey Paper's. On 3 January 1943 the decision was made to bring the 2/4 back to Australia, Callinan was advised and volunteered to stay behind and organise native resistance, also adding that this course of action is of value for Australia. He regretted that after all the effort of a long period from February 1942 till January 1943 should now come to naught. On the night 9-10 January, less an out of contact detachment at Ainero, the 2/4 and 50 Portuguese had trouble negotiating the wild surf going to board the destroyer HMAS Arunta but the warship made it to Darwin without mishap. Lieutenant Flood and twenty volunteers, after another new name, "S Force" set-up base at Fatu-Berliu and inevitably the Japanese with the help of informers hunted them down, scattering them into small groups. Eventually the Australians and the stranded detachment at Ainero came together in the far east end of the island where 'Z Special unit group was operating. Ultimately they all had to be evacuated due to enemy pressure and on the 10 February 1943, only a week and a bit less than a year since the beginning, the Lancer force stragglers, Z Special unit and S Force boarded the submarine USS Gudgeon. The operation on Timor had no positive strategical value except to divert a measure of Japanese attention at a critical time and perhaps in part led to a build up of Japanese forces on Timor during 1942 in anticipation of a possible Allied attempt to re-occupy the whole island. Australians causing some 2,000 Japanese casualties compared to 40 Aussies killed. Most important they demonstrated how a lost cause could be turned around and at a time when such examples were the greatest value to fellow Australians and other fighting the Imperial Japanese aggressors. They were organised and trained commandos for guerilla warfare and circumstances they found themselves in permitted such tactics and actions. The country could supply them, friendly population to assist them, there was rugged nature of the environment to aid them, conceal them and hinder regular operations against them. It was not the rainforest jungle of typical tropical Papua New Guinea, but bush country like the Australian type which allowed long range ambush and clear paths for a quick getaway, it was like home to Australian troops especially those from Western Australia. The pattern of warfare in half of Timor waged by the Australians and Dutch assistance, perhaps resembled the warfare developed by the Boers. The Boers failed through exhaustion, the country no longer could support them and the friendly population had been swept out of the area of operations. Smarmily the Australians had to get out of East Timor because most of all a large section of the native population was either no longer friendly or was actively hostile towards them. 1. MacArthur viewed the increase in Japanese strength in Timor as purely defensive to secure themselves against attack from Australia and to suppress the continuation of the successful commando tactics, which has been pursued by Australian and Dutch, forces. 2. The C-in-C added he did not posses the resources to retake Timor. Further more the Japanese control of the seas in this region and a force from Australia could not land by air or supplied by air in sufficient strength for recapture of this island. 3. Any plans for retaking Timor were a long distant project. Appendix (of course after he returned to the Philippines first).